If Trees Could Talk provides the highest quality tree trimming in Tampa Bay. This is because, unlike most other tree services, our Arborist is always onsite and often the one doing the work. Most tree services don't even have an Arborist on staff. 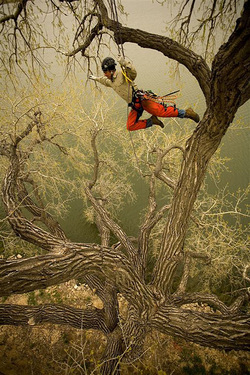 Of the tree services that do claim to have an Arborist, most do not employ the Arborist directly but only use them in cases where one is needed. The tree services that do directly employ ISA Certified Arborists usually use the Arborist to do sales and public relations, while using others to actually perform the work. This means the only time an Arborist is actually on site is while he or she is giving you an estimate. If Trees Could Talk was founded by an Arborist in 2007. Our Arborist meets with our clients to determine the best way to meet their needs while keeping the trees long term health the first priority. When it comes time for the work to be done, if our Arborist is not the one performing the work, he will be on site ensuring that all work is being done correctly. It is also our policy to have the Arborist meet with the client at the time of completion and make sure that 100% satisfaction is achieved.